Figure 9.9 Fungal-spore spike above the K-T boundary in New Zealand (from Vajda and McLoughlin 2004). Copyright 2004 AAAS; reprinted by permission. 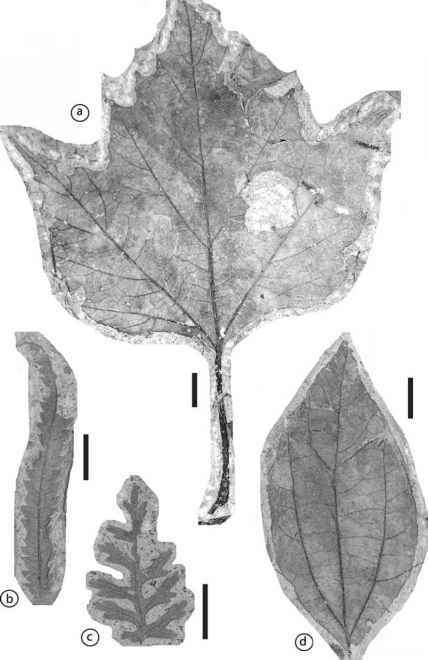 Figure 9.10 Paleocene leaves from northwest Nelson, South Island, New Zealand. a - (DMNH 6654) b - Proteaceae (DMNH 6611) c - (DMNH 6692) d - Lauraceae (DMNH 6640). Scale bar is 1 cm. saprophytes existing on formerly photosynthetic vegetation that was destroyed by effects of the impact event. It is quite interesting to note that in his early work on Upper Cretaceous and Paleogene palynostratigraphy, Raine (1984) was building on the earlier work of Couper (1960), who elucidated the stratigraphy and palynofloral succession in New Zealand. Couper correlated the terrestrial palynofloras of the Maastrichtian and Danian equivalents (the Hamurian and Teurian stages, respectively) with marine foraminiferal biostratigraphy, thereby laying the groundwork for locating the K-T boundary in the nonmarine strata of New Zealand. Some 40 years later, the research of Vajda et al. 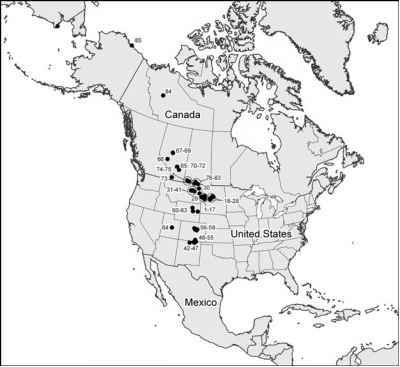 (2001) pinpointed the boundary in those rocks and made the major discoveries that contribute to our understanding of the global effects of the K-T boundary event on plants. The megafloral record of the K-T boundary in New Zealand is being developed in two areas. One of us (KRJ) made collections near the Moody Creek Mine and Compressor Creek sites in 1992, retrieving fossil leaves from several locations in the Rewanui and Goldlight members. This area is heavily forested and outcrops were only accessible in road and river cuts, a situation that prevented precise correlation between localities. The Rewanui Member is primarily a fluvial sequence composed of sandstone, mudstone, and coal beds, whereas the Goldlight Member is a relatively uniform, dark gray mudstone of lacustrine origin. Because of this distinct difference in depositional environment, the small size of the collections, and the difficulty of correlating the localities, this work remains unpublished. Kennedy et al. (2002) described Maastrichtian and Paleocene megafloras from the northwest tip of the South Island in Nelson. Here the Pakawau and Kapuni groups are exposed in roadcuts and have yielded well-preserved leaf impressions and palynomorphs. To date, this work has generated paleoclimate estimates for individual localities but has not been sampled with enough density to measure megaflora biostratigraphic trends. Some representatives of the Paleocene megaflora of New Zealand are shown in Figure 9.10.